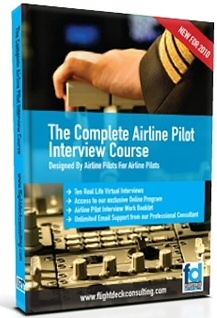 This DVD from Flightdeck Consulting has been produced and developed by airline pilots for airline pilots. Through a series of fully interactive virtual interiews combined with our pilots interview work booklet you will be completely and confidently prepared for your airline interview. For many years Flightdeck Consulting have helped hundreds of pilots from all corners of the globe secure their dream of flying for the airlines. Their success has led them to develop "The Complete Airline Pilot Interview Course" to allow pilots worldwide the opportunity to ace their job interview. Most pilots spend upwards of $50,000 on their training and countless years in general aviation or other low paying jobs, only to invest little or no time on the most critical stage of their career, the airline interview. Failure to prepare correctly can result in the loss of hundreds of thousands of dollars in potential income, as well as years of seniority. Todays modern airline interview is based on the behavioural interview concept and should not be attempted unless fully prepared. Most pilots are very good at what they do, but perform poorly when it comes to the airline interview. Quite often they are left bewildered as to why they were unsuccessful, especially when another pilot, with far less experience, has been offered a position. The answer; they performed better in the interview, simple as that! Eight Virtual Interviews to help you perfect your interview technique. Complimentary Email Support from professional airline interview consultants. "How it works is very clever!" "It’s brilliant psychology and, if my experience is any measure, the sort of questions and responses are much more likely to stick and be there for recall when needed, than they would be if you had simply, in the words of the immortal Manuel, “learned it from a book”. At any stage you can upgrade your purchase to include our personalised One on One Interview Coaching service conducted via Skype or telephone with our professional aviation interview consultant Sasha. Be the Standout Candidate at your interview!